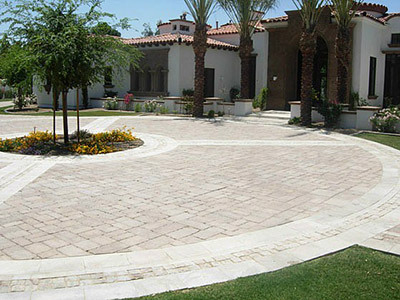 Advant-Edge Decorative Curbing & Landscaping, specializing in design to landscape completion. We are a one-stop shop for all your landscaping needs. We handle all aspects of residential and commercial landscaping projects. Big or small, we do it all. If you can dream it, we can do it. "At Advant-Edge we treat every landscaping project as if it were our own". I started out growing plants and installing sprinkler systems at a local high school, I then graduated and started a business doing landscape curbing in 2005. In 2006 I saw the need to offer the complete landscaping package to save homeowners not only time but money too. I found that offering all of the services through one company was more beneficial to the customer. Now Advant-Edge has expanded its operations with 3 divisions curbing, landscape construction and Landscape maintenance where we now handle all aspects of landscape construction and maintenance for residential customers as well as commercial. Then in 2007 Advant-Edge expanded yet again. We purchased a local nursery which is now called Advant-Edge Nursery located in Peoria were we own and operate our nursery and grow most of our own nursery stock.